For real-world examples during the training classes, a variety of sample parts were set up on several Loc-N-Load fixture plates. This pallet-style fixture system allows trainees to quickly and easily load and unload parts onto the coordinate measuring machine (CMM). 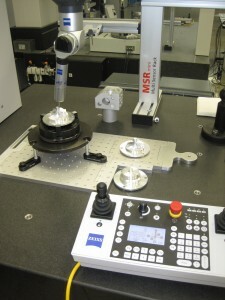 To automate stylus re-qualification, reference spheres were set up on a dedicated quick-swap plate. Figure 1: Multiple fixtures can be added to a CMM, leaving granite exposed to check parts quickly and without interruption using an angle/stop plate. “Reducing the time it takes to build and break-down inspection setups and faster recalibration means more time can be spent teaching about equipment features and programming techniques,” says Oakes. As a major machine tool dealer, MMTS must perform inspections of turnkey parts during the setup, as well as meet customers’ quality requirements during the runoff. Having the flexibility to mount a part onto a pallet allows multiple jobs to run without breaking down setups or moving jobs to other machines to avoid scheduling bottlenecks. Fixtures with sample parts are set up and exchanged without delay. 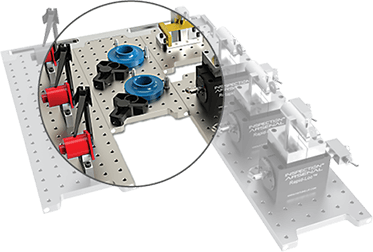 During advanced training, multipart fixtures are designed on a large Loc-N-Load plate to teach pallet programming. Training sessions also reinforce probe calibration, which is done quickly using a dedicated plate for the qualifying sphere. The dedicated plate locates the same every time. The machine is calibrated, and the sphere and plate are moved out of the way to free up the entire work surface for inspections. The same process is used for gauge calibration on multisensor machines, where this task is performed more often. Figure 2: Silver-Bullets with hole adjusters are used to fixture this part for inspection. Simple hole adjusters provide infinite adjustability between holes of the Loc-N-Load plates’ 1-in. × 1-in. hole pattern. Moving from an instructor in a classroom setting to a contract inspection job is also quick and seamless. Classroom fixtures remain intact and are swapped out to shift gears. 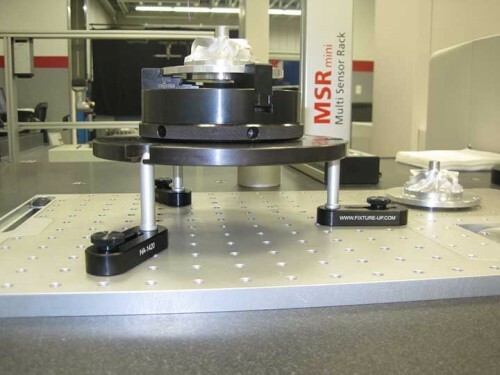 The MMTS metrology lab helps to deliver turnkey solutions and may have several in process simultaneously, so quick-swap plates speed this process, as well.Time-saving benefits extend beyond the classroom. The technique-altering fixture concept drastically reduces the time for inspection and helps break workflow bottlenecks. Many student inspectors and engineers apply the lean fixture solution at their own companies with great success. Companies focused on lean have fundamentally changed their quality inspection techniques. For these and many other companies, the ability to alleviate quality control bottlenecks not only reduces inspection costs, but the faster workflow also reduces expensive spindle downtime on the shop floor. Classes at the training center are scheduled for four days with trainee capacity ranging between three to six students. Classes are delivered 20 times each year for an average of 100 customers per year. © 2015 Quality Digest Magazine. Copyright on content held by Quality Digest or by individual authors. Contact Quality Digest for reprint information. We are very pleased with the reduction in set up times it offers us allowing quick changeovers between set up. The product is proving to be a great help. We now make our inspection fixtures to attach directly to the rail which allows us to automate more of our inspection programs as we are starting from known locations.